We visit hospitals where Veterans are not able to leave the lock units that they reside in. 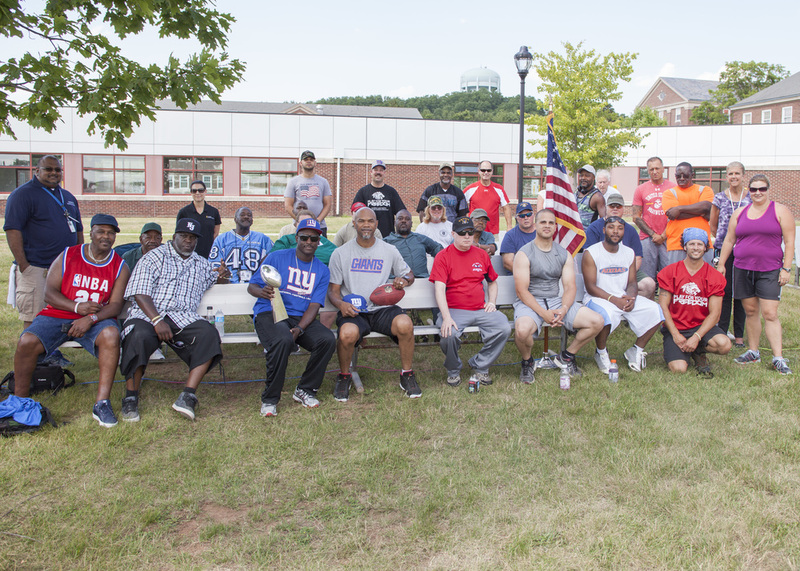 We team up with the NFL alumni who are part of our program and spend a couple hours with these men and women at the very early phases of their recovery. We share some stories from the NFL alumni, some words of encouragement and education on how they can be apart of PFYF as they move through recovery. We bring our display only PFYF football helmets with us as symbols of hope for the Veterans. The helmets symbolize that we are here for them when they are ready to join us. They get them autographed by our NFL Alumni and PFYF staff. We have success stories of Veterans moving from hospital to hospital with their helmets. It warms my heart to hear and keeps us pushing forward. Our monthly workshops involve all forms of physical fitness and cultural enjoyment. Football has been our most popular workshop but we have done track, basketball, baseball and horseshoes. We use exercise and positive peer-to-peer support to encourage our Veterans to stay active and feel appreciated. Both are crucial for a balanced life and recovery. All money donated to our program goes toward facilitating these workshops from the site, insurance, food, drinks & other expenses incurred during set up. Once the Veterans who have been through our program, they are strongly encouraged to remain in touch with us and volunteer in our programming. We believe this is the final piece of our puzzle, as who better to help Veterans in the early phases of recovery than the men and women who have just experienced it. It's a positive chance to finish what we started together. WE care for our nations service members, their families and honor those who gave it all.